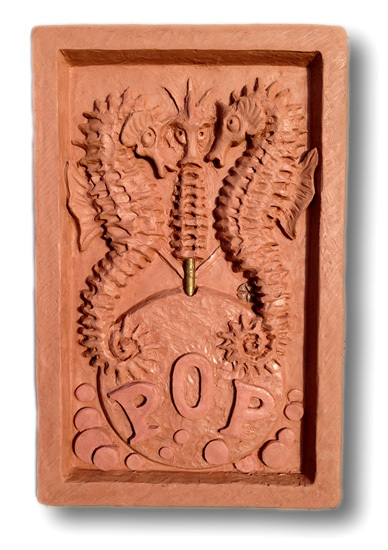 I’ve been working on a project with a good friend of mine, Dave Doherty, on a relief tile that commemorates the now deceased, Pacific Ocean Park (POP), an amusement and theme park that once existed in Santa Monica, CA. I’m posting a picture of the sculpture I just finished here. I’m working on the first casting of the tile, and will be offering it as a concrete tile, which can be purchased on my Studio Store link. Stay tuned, I will post as soon as I have images to see. To get you really interested, Dave has provided a bit of the history of Pacific Ocean Park below, and his Web site, RIPPOP.COM, has a ton of pictures, pre, and post-mortem. Daves’ Web site is very cool, so check it out if you love old California theme park history. 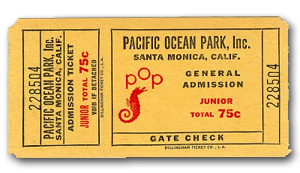 “Pacific Ocean Park” or “POP” was a 28 acre space age, nautical theme park pier that operated in Santa Monica from 1958- 1967. It was created by the owners of Santa Anita Racetrack, (the LA Turf Club) and CBS television with a variety of attractions including the “Sea Serpent” Roller Coaster, the “Banana Train Ride” as well as live television broadcasts of shows like “Wink’s Dance Party.” This beautiful tile is a view of the three iconic Seahorse sculptures and “POP” bubble that stood above the Starfish entrance to the park. From 1968 – 1974 the remains of the pier became the home – base of the “Dogtown and Z-Boys” surfing phenomenon. This entry was posted in New Projects by kwhittWP. Bookmark the permalink.